This is a book I used to read to my sister when she was little. 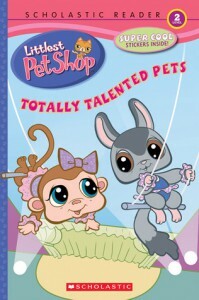 Littlest Pet Shop was a brand of small toys that extended to being coloring books, scholastic books, and even some video games. This book is about some of the animals having special talents, like playing music and being a magician to being able to walk across a tightrope and juggle. I would use this book specifically for quiet reading time.